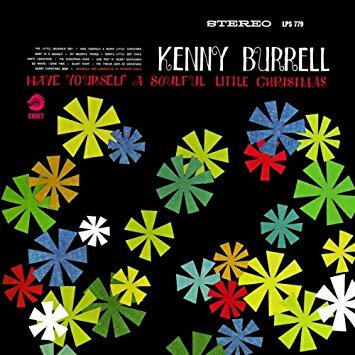 If you're a jazz guitar fan looking for a Christmas album, Kenny Burrell recorded a Christmas album in 1966. He was bouncing around labels at the time so it's an album that fell through the cracks for years. But it's now available as a budget CD. Burrell left Blue Note in 1963. His final album for Blue Note was Midnight Blue which was his most popular album. He recorded a couple of albums for Prestige with Jack McDuff and Shirley Scott. And he recorded a couple of albums for Verve including Blue Bash! with Jimmy Smith and Guitar Forms with Gil Evans. Then he went to Chicago and signed with the Chess Records label Cadet. He recorded three albums for Cadet and producer Esmond Edwards who produced most of the jazz albums recorded at Chess. Have Yourself A Soulful Little Christmas was Burrell's second album for Cadet and it was released in 1966. It is Burrell performing Christmas standards with an orchestra conducted by Richard Evans who was a house arranger at Chess. This album was out of print for years. Universal now owns the Chess catalog and Have Yourself A Soulful Little Christmas was released by Verve on CD in 1993. It's available as a budget CD and it's perfect for jazz fans looking for a Christmas album. Edwards left Chess for Verve in 1968 and Burrell went with him. By then Creed Taylor was running Verve and he left and eventually would start CTI Records. Edwards returned to Chess in 1970. Burrell recorded one album for CTI and then recorded for Fantasy in the 70s. Here's a video for The Christmas Song by Kenny Burrell.